We will be holding practice runs on the course (20k loop) on the first Sunday of March (1st), April (5th) and May (3rd) - at 8 am. Please bring along a Twonie donation for the conservation area. The run is "unsupported" so bring any refreshments you require. Link to the full participants guide coming soon. Aid Stations will be present at roughly 3K, 9K, 12K, 19K of each loop and at the Start/Finish of each 20K lap. All runners are advised to carry fluid and food. When you select the 100 mile relay option please note that you need to register your full team at once. The total price is $340 for the entire team. 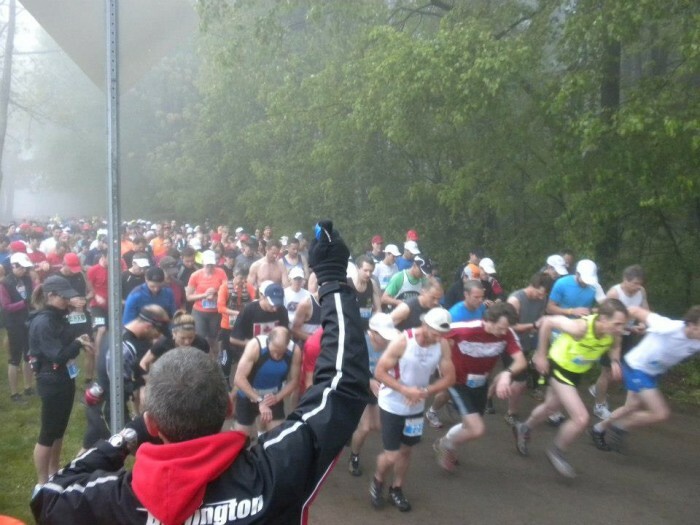 The Sulphur Springs Trail Run takes place in and around the Dundas Valley Conservation Area in the City of Hamilton, Ontario (formerly the Town of Ancaster). This park is managed by the Hamilton Conservation Authority. All race events will take place on a 20K loop consisting of approximately 97% trails and 3% roads within the conservation area. The 10K event will use only the western portion of the loop. 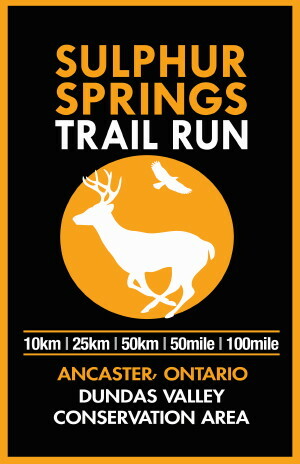 While you are running the Sulphur Springs Trail Run you will be traveling through the beautiful Dundas Valley Conservation Area which is part of the Hamilton Region Conservation Authority park system and includes part of the famous Bruce Trail from Queenston Heights to Tobermory (approximately 800K). The park is open to the public on race day so be courteous to and aware of other users. This will include runners, bikers, horseback riders and walkers. Bear in mind that you will be running through wilderness and may encounter deer, coyotes, raccoons, skunks and others. IF YOU ENCOUNTER ANY WILDLIFE, MAKE A LOT OF NOISE. DO NOT ATTEMPT TO APPROACH ANY ANIMAL . 12 noon - 6:00 PM Initial course marking. If you are interested in helping out, contact the race director. 12 noon - 5:00 PM Final trail marking. 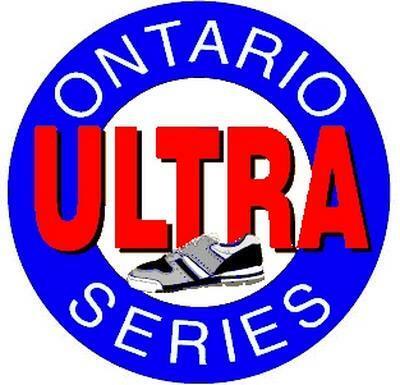 3:30 pm - 5:00 pm Race kit pick-up for 100 Mile runners at the Ancaster Community Centre on Jerseyville Road. Tents located at rear of property. Drop bag drop off location. 5:00 PM - 7:00 PM Pre-race briefing and dinner for solo 100 mile runners only. MANDATORY for all 100 mile runners. Location at start/finish area under tent cover. 5:00 Am - 7:45 AM Race kit pick-up and race day registrations fo all other events. 5:45AM - 6:00 AM Pre-race announcements. 6:00 AM Start of the 50 mile, 100 mile and 100 mile relay. 7:15Am - 7:30 AM 25K and 50K pre-race announcements. 7:30 AM Start of 25K and 50K races. 8:00 AM - 8:15AM 10K pre-race announcements. 8:15 AM Start of 10K. 9:00 AM 10K post food and refreshments. 9:30 AM 10K awards ceremony. 10:30 AM 25K awards ceremony. 12:15 M 10K ultimate cut-off. 1:30 PM 50K awards ceremony. 2:00 PM 50 mile awards ceremony. 3:30 PM 25K ultimate cut-off. 9:30 PM 50K ultimate cut-off. 12:00 midnight 5- mile ultimate cut-off. 8:00 AM - 12:00 noon Continuous light post-race breakfast at start/finish. 11:00 AM 100 mile awards ceremony. 12:00 noon Ultimate cut-off for 100 milers. End of race. Planning for the 2016 event starts. 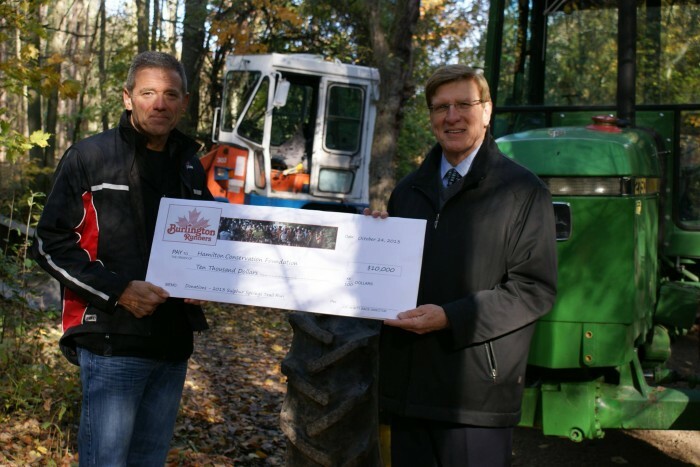 More that $60,000 from the proceeds of our Sulphur Springs races have been donated to help support the Dundas Valley Conservation Area. Take a look around you as you run to see the legacy you are leaving behind thanks to your participation in this race. Below, the 2013 race director Joe Hewitt is presenting a cheque for $10,000 from the proceeds of the 2013 race. One project this money helped to fund can be seen in the background. This equipment brought in over 20,000 tons of screenings to repair and upgrade many of the low lying areas of the trail.